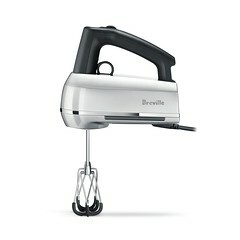 The Breville® Handy Mix Scraper™ BHM800SIL – An intuitive speed sensor and Breville® Beater IQ™ make this the ultimate mixing machine. You can illuminate the ingredients while mixing, pause any the timer so that more ingredients can be added, and use the quick release trigger to easily remove or change the attachments as needed. A. Balanced ergonomic handle. B. Cord Wrap. C. Quick release for attachments. D. DC Motor. E. Swivel Cord. F. Mixing Light. G. Storage Case. H. Beater IQ™. I. Count-Up Timer. J. Pause Button. K. On/Off Switch. L. 9 Speed plus Turbo Boost. 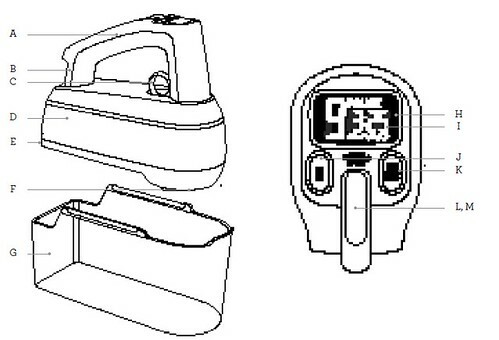 M. Intuitive Scroll-Wheel Speed Selector. N. Quiet Scraper Beaters. O. Dough Hooks. 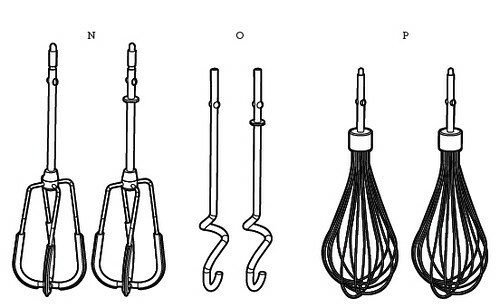 P. Balloon Whisks.